•	Test with single memory module on A1 slot (non-ECC, un-buffered). •	Reseat video card firmly and 6+6 PCIE power (if applied). •	Plug the 24 + 8 or 4 pins ATX power. •	Turn on the power (using onboard power button) to check if its post. Pros: Absolutely great case. Has well over enough PCI slots for insane Graphics cards. Also great that it has 4 ram slots although watch out on what size cpu fan you get because some do block some of the ram slots. Cons: For some reason the Lan ethernet port on the motherboard didn't work, but had a spare card for one, so a easy fix just a bit annoying. Pros: Lots of options, excellent pci-e slot configuration allows for plenty of space when running multiple graphics cards, ton of sata ports and usb ports plenty 3.0 ones too. Looks excellent as well, if you're going for black and red build its one of the best looking 2011 boards out there. Cons: UEFI/Bios layout and options aren't the best and can be improved. Other Thoughts: If you get this board make sure to update bios I bought this board when it first came out and there have been few issue that were fixed with bios updates. Bottom line is, for the money you'll pay this board is excellent, sure bios may lack some options you find on Rampage IV but right now this board is half the price of Rampage, and I got my 3820 to 4.75GHz with around 1.33V. We sincerely apologize for any inconvenience this may have caused you. Sorry to hear the the memory slots has malfunctioned after 4 months which due to nature of electronic product it can happen. Test with known good memory on A1, B1, C1 then D1 (if 8 sticks A2,B2,C2 and D2) one at the time to check if the symptom still occurs. If you have any technical questions or warranty issues please contact our Tech Support at http://www.ASRock.com/support/tsd.asp. We can assist you shortly. Pros: The board is easy to setup and the overclocking is so easy a cave man can do it. 4.8 cpu 2400mhz ram using auto settings! Other Thoughts: I never expected the board to be this good! Pros: This board had all the things i wanted and 4 PCI-e slots for four double slot gpus. 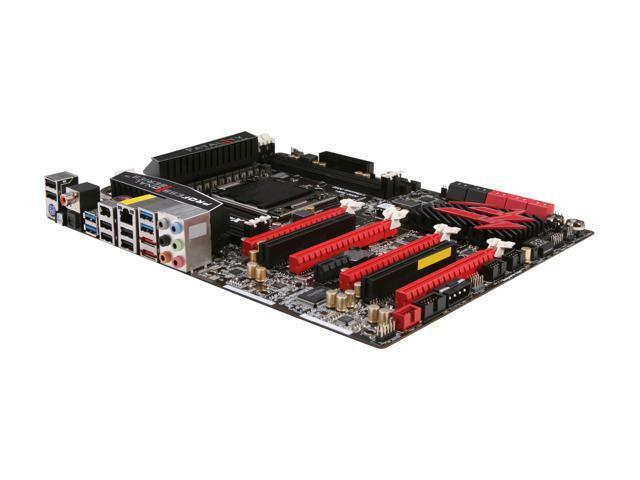 Cheapest priced board for the 4PCI-e slots i needed. Cons: The board would lock up every other day, but i assumed it was because i was running four 7970s and the bios and drivers weren't mature enough. Today, the computer locked up three times in an hour. Now it will not boot. No display, no bios beeps.. no beeps... dead. only the fans spin and the power and reset buttons are illuminated on the board. removed parts one at a time to no avail. system isn't overclocked. Other Thoughts: I'm thinking i should have spent the extra $40 for a different board. We sincerely apologize for any inconvenience this may have caused you. Please trouble shooting the mainboard for below steps with known good components; remove the mainboard from inside computer to outside. Place the mainboard on empty mainboard box, clear the CMOS, reseat the CPU with heatsink fan as well, inserts 1 memory module only in A1 slot, video card with 6+6 power (if applied), power supply with connecting 24 pins + 8 pins ATX power to the mainboard, plug the computer case’s power switch to mainboard's front panel header and try again. For the lock up issue, please set the UEFI BIOS default, test with 1 stick memory in A1 slot, try with another memory if its same issue. If you have any technical questions please contact us at http://www.asrock.com/support/tsd.asp. We can assist you shortly. Pros: Plenty of features, everything that 99% of gaming rigs will need. The UEFI is easy to navigate and use. Everything was recognized without issue, no messing around with drivers or firmware updates just to get things to work at all. Comes with plenty of SATA cables and hardware. Finally, it's a very cool looking board. The red is a nice color to go with a black case in my opinion and the board's heatsinks are a unique look. The price also compares favorably to other ASrock and ASUS boards that are probably a little bit overloaded. Cons: I'm not sure how other LGA2011 boards are (It's a huge socket and heatsink plate assembly) but you may have CPU cooler clearance issues if you're using air cooling. A Noctua NH-D14 will fit if you have the fans facing the back of the case but it will just touch the memory a bit if they have any top heat spreader fins. I also had to use the third PCI-E slot for my video card as the cooler would have touched the back of it. Mounting the cooler to blow bottom to top would not work unless you only had 1 DIMM. Again, I haven't used another LGA2011 board so I can't say if this is unique to this board. I didn't knock an egg off because it is a minor inconvenience in the grand scheme of things. I'm still able to overclock my CPU some while keeping temperatures at very safe levels. Other Thoughts: This was my first ground up PC build and I had zero issues getting it up and running. The BIOS did its job perfectly and the users manual made connecting the front panel easy. I would definitely go with ASrock again for my next build. Pros: Awesome software lots of extras for gaming solid board easy hardware install the code reader works awesome helped with my trouble shooting. Cons: This board does not work out of the box you need all updated drivers for 100% proper function and detection.Would not detect 16 gigs of G skill ram it didnt read any when I put all 4 sticks in had to put in one at a time played with that for a few days.In order to use all the pci slots for sound card or nic card ect ect you have to go with water cooled video cards because fan cooled video cards are to fat for everything to fit if your going 3 X 4 SLI. You can go with external PCI slots for your extra hardware for a lot less then water cooled video card which are at insane prices.